“Reading, PA has been one of my favorite cities to work with as we lead women’s events all over the country. 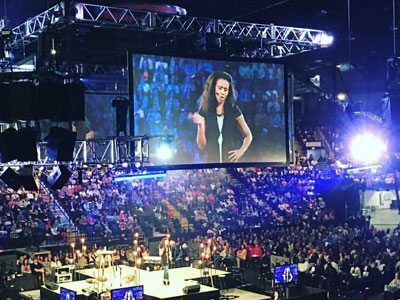 We brought Priscilla Shirer (author, speaker, star of the War Room Movie in 2015) to Reading and drew just under 7,000 attendees and simulcasted the LIVE event all over the world. The professional courtesy that we experienced at the Santander Arena helped our event run smoothly and served our attendees and my team well. The staff gave me confidence that they were a true partner in our event. The Double Tree by Hilton Reading went over and above in every facet to serve my team, my platform, and our guests. The hotel and it’s rooms were beautiful, extremely clean and welcoming. Not to mention that the hot cookies were an added bonus. Their restaurant was one of the best that I have had the pleasure of visiting as I travel the US and stay in many hotels. “Following the successful and well-attended PAC National Meet July 12th -18th, I speak for all of us in sending our sincere commendation to Go Greater Reading for the outstanding service you provided, starting way back a year or more before the event. You personally, Margo, as well as your entire staff were most helpful in so many ways, and your attention to details, venue selections, the IMAX movie night, parking arrangements, and working with Stella on refreshments, played a major role in enhancing an almost flawless series of events that week. 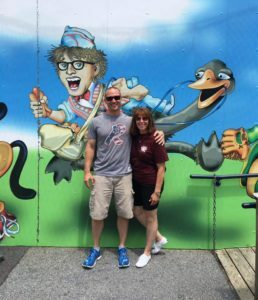 “Following PBA in Valley Forge, PA, under the direction of Margo DeRouchie, National Sales Director, Go Greater Reading, we enjoyed an outstanding FAM tour in the Berks County Area. They housed us; we enjoyed outstanding meals, and quality attractions. I would encourage anyone who has not taken their groups to the Berks County Area, to give Margo a call, and set up a visit. You will not be disappointed! 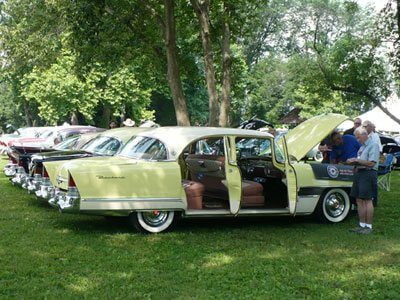 “In the past several months, we have taken two one day mystery trips to the Greater Reading area. 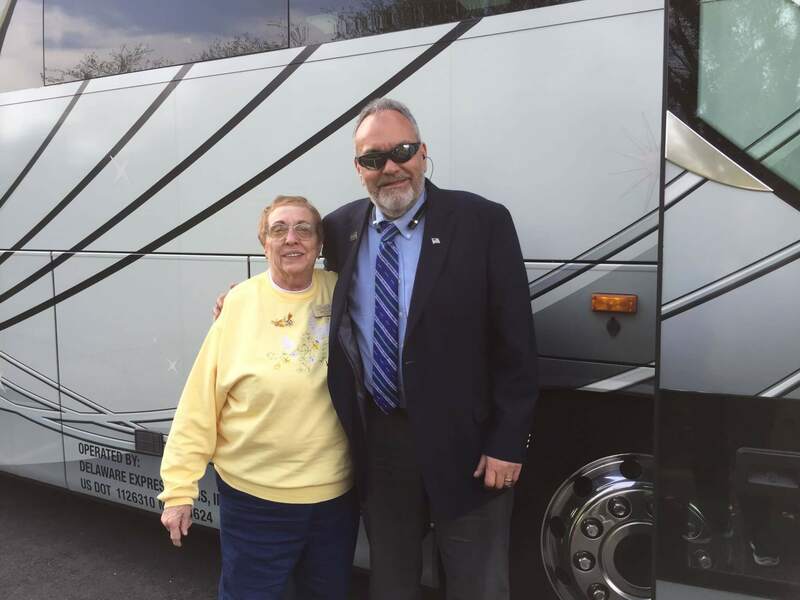 Our first mystery day trip took us to Reading, PA, where we met our tour guide Charlie Adams for our tour of the Charles Evans Cemetery and the local area. What a treat to have Charlie take us through the cemetery giving us the stories of famous people and ghosts along with many other interesting things about this cemetery. Following our visit to the cemetery, we took a city tour on our coach. Our lunch was really a treat at the beautiful Stirling Guest Hotel. The Stirling is a restored 1892 mansion with a carriage house and is located in Reading’s Centre Park Historic District. The mansion features extraordinary architecture and beautiful furnishings with each room having been completed in different wood works. The group enjoyed a delicious tea luncheon buffet while at the Stirling Guest Hotel. Our second mystery daytrip to the Greater Reading area took us to the Conrad Weiser Homestead in Womelsdorf. Here the group learned of Conrad Weiser and his work with the Iroquois Indians in the French and Indian War. He was also an important figure in the colonial frontier settlement. The volunteers that conducted our tour were very informative. The group had a nice buffet lunch at The Stouch Tavern in Womelsdorf. The tavern had been a stagecoach stop. 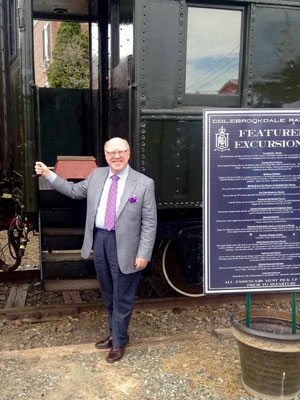 Originally visited as a mystery day trip in December of 2014, The Colebrookdale Railroad has become one of our groups train trips. The staff of the railroad do a great job and also if having lunch on the train one will find the menu to be very tasty.